WestJet just announced a new route, introducing non-stop flights between Abbotsford (YXX) and Las Vegas starting in October 2015. As is sometimes the case when WestJet (or any airline) starts a new route, there's some great prices to help fill the plane. It looks like Thu-Sun flights in October, November, and early December are currently priced at $225 CAD, roundtrip including taxes. Sun-Thu flights are slightly cheaper, at $197. Allegiant does sometimes slash their prices into the $100s, but that's typically for the weekday flights (eg: Mon-Thu). Overall, it's a pretty great introductory price, comparable in price to flying out of Belingham, without the border crossing, and, well, Allegiant. ... and then click the little bar graph icon below the return date. Browse the available date combinations and click through from Google Flights to WestJet's website to complete the booking. Update 1 @ 10:45 AM PST - Prices already seem to be creeping up. All of the Thu-Sun flights were $225 when I first posted this. Now Nov 19-22 and Dec 03-06 are the only ones still showing this price. The rest seem to be hovering between $238 and $249. Update 2 @ 10:49 PM PST - Nov 19-22 now seems to be the cheapest Thu-Sun flight remaining, at $249. Update 4 @ 8:14 AM PST - If you purchase these through Priceline.com they can be had for $135 USD which will work out to $168 CAD after exchange when using a Canadian credit card. Note: You may need to specify that you want Priceline to display prices in $USD, and not $CAD. When they are displayed in $CAD, they will come up as $195 CAD. $135 USD is a better deal. Even after your credit card adds their 3% foreign exchange fee it should still work out to $168 CAD total that is charged to your credit card. If you look at the top right of the Priceline website you'll see a way to set the currency if you need to. Oct 29 - Nov 01 -- Halloween in Vegas anyone? Oct 31 is a Saturday this year. Update 5 - May 9 @ 9:40 AM PST - The prices seem slightly higher today. Most date combinations on Priceline are showing at somewhere between $148 and $161 USD roundtrip including taxes. Update 6 - May 22 @ 10:00 AM PST - Some more dates have opened up for this deal, including over New Years! Try Dec 31 to Jan 03 on Priceline. Mar 17 (Thu) to 20 (Sun) - St. Paddy's Day in Vegas... madness. For live discussion of this deal, or to get some amazing travel advice (to anywhere) from your 24,732 fellow travelers in Vancouver, join us in the YVR Deals Facebook Group. 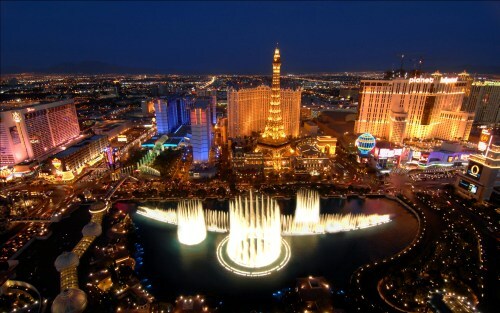 flight deals, westjet, united states, abbotsford, yxx, las vegas, nevada, las and north america. 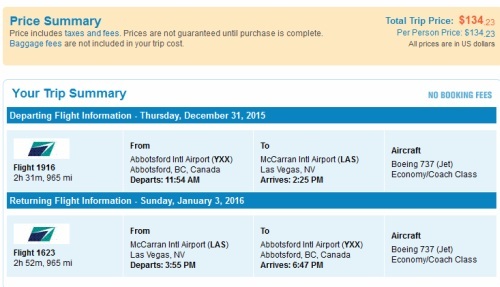 4 Responses to "Abbotsford to Las Vegas - $197 to $225 roundtrip including taxes | Oct, Nov, Dec"
Just booked! Thanks, Chris! This was fantastic find! I would way rather drive out to Abby vs. Bellingham and let's face it WestJet vs. Allegiant, isn't really a competition. Agreed! If WestJet can offer more prices like this in the future it would definitely steal people away from BLI. Dang it. Too slow. 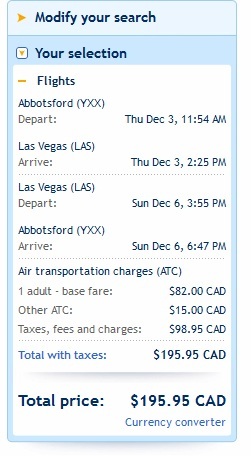 The best I can find is #171 USD for Sept.
WestJet doesn't start their new Abbotsford-Las Vegas route until late October.